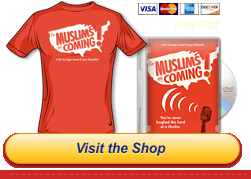 Cast | The Muslims Are Coming! Negin was born and raised by Iranian parents in the desert of Southern California. Her unwavering commitment to social change led her to Cornell University Government program as an undergraduate and then to Columbia’s School of International & Public Affairs where she earned a Masters in Public Policy. Before surrendering to the world of comedy, she worked as a policy advisor for the City of New York. Negin is the director/producer of the current feature film release, Nerdcore Rising, a comedy about Nerdcore hip hop. The film premiered at the prestigious South by Southwest Film Festival, continuing on in the festival circuit to winning Audience Favorite awards, the jury prize for Best Documentary Film, and a Best Director award. The film had a limited theatrical release then went on to DVD, selling enough copies in its first month to be on Amazon’s top ten list. Farsad also recently developed and wrote the MTV series, “Detox” and directed and produced the Comedy Central series, “The Watch List.” She wrote for the first season of the upcoming PBS cartoon series, “1001 Nights.” You can also see her as on-air host and writer for IFC News and for AOL. She originally earned her film chops as a producer and story editor on the film A Cricket in the Court of Akbar where she produced an 8-week shoot on location in Rajasthan, India. Her short film Iran-ing on Empty, which she wrote, directed and appeared in, has been a selection of numerous comedy festivals while her other short film Hot Bread Kitchen won first place in the Lifetime Television Women in Filmmaking Awards. She is thrilled to join Obeidallah for yet another project – the last time they worked together was for a short film commissioned by Queen Rania of Jordan for her video project to dispel Middle-Eastern stereotypes around the world. That film completed a series of shorts that garnered the Youtube Visionary Award for Queen Rania. As a standup comedian she has opened for the likes of (Senator) Al Franken in venues ranging from the Laugh Factory in New York, the Comedy Store in Los Angeles, and Town Hall on Broadway. Her work has been called “‘Smart, funny and fascinating” by the Wall Street Journal, “hilarious & delightful” by Salon, and a “a shining exception” by the Dallas Morning News. Dean’s comedy comes in large part from his unique background of being the son of a Palestinian, Muslim father and a Sicilian, Catholic mother. Dean, an award-winning comedian who was at one time a practicing attorney, has appeared on “The Axis of Evil” Comedy TV special, which aired in the US on Comedy Central and in the Middle East on Showtime Arabia. He is the co-creator of Comedy Central.com’s critically acclaimed Internet series “The Watch List” featuring a cast of all Middle Eastern-American comedians performing stand up and sketch comedy. Dean has appeared twice on ABC’s “The View,” on the nationally syndicated TV series “Comics Unleashed with Byron Allen” and was one of five comedians profiled in the recent one hour TV Special entitled: “Stand Up: Muslim-American Comics Come of Age” which aired in the US on PBS and internationally on BBC World and Al Jazeera. Dean is the co-creator/co-producer of the New York Arab-American Comedy Festival also serves as the Executive Director of The Amman Stand up Comedy Festival – the only annual stand up comedy festival in Middle East history. Dean has appeared on numerous international and national television and radio programs including CNN’s “What The Week,” “American Morning” and “The Situation Room,” CNN Headline News’ “The Joy Behar Show,” PBS’ “Newshour with Jim Lehrer,” ABC’s “Nightline,” HD’s “Dan Rather Reports,” Fox News’ “Geraldo at Large,” Al Jazeera’s “Min Washington,” MBC’s morning show, “Democracy Now with Amy Goodman,” NPR’s “All Things Considered,” and CNN International’s “Inside the Middle East.” In addition, he has been featured in various publications including Time magazine, Newsweek, The New York Times, The Washington Post, The Wall Street Journal and The Los Angeles Times and he frequently writes for The Huffington Post. He also co-created the comedy show “Stand up for Peace” along with Jewish comic Scott Blakeman as a way of fostering understanding between Arab, Muslim and Jewish-Americans. Preacher Moss is clearly the new prototype for comedians. A writer for "The Damon Wayans Show" and "Saturday Night Live," his comedy stylings are distinguished for being sculptured out of the everyday relevance of life and the rare glimpses of truth we get to see in this super-sized slurpy of a reality. Moss has been playing to the hearts and minds of comedy audiences all over the country. With his insight on "racial understanding vs. racial interaction" he has quickly become the funniest social commentator on the comedy scene today. Kareem Omary, or as he’s known in MAC circles as “The Potty Mouth” was born and raised in the Middle East and started performing comedy in New York City in 2009. He’s earned his chops at various clubs including the Gotham Comedy Club and the Broadway Comedy Club. He was most recently seen on MTV.com and is thrilled to join the MAC cast representing the ever-growing Latin-Muslim category. Oh yes, Kareem is half Peruvian, half Syrian, naturally. What else would he be? Maysoon is an actress and professional standup comedian, who received her BFA in acting from Arizona State University. She is the co-founder and co-executive producer of the New York Arab American Comedy Festival and can be seen on Comedy Central’s The Watch List, PBS’s America at a Crossroads: Muslim Comics Stand Up, and in Adam Sandler’s You Don’t Mess With Zohan. In the fall of 2006, Maysoon debuted her one-woman show LAW at LA’s Comedy Central Space which was produced and directed by the legendary Kathy Najimy. In 2008, her screenplay LAW was chosen for the Sundance Screenwriters Lab and is now slated to begin production with Maysoon as the lead. Currently she is a headliner on the Arabs Gone Wild Comedy Tour. As a professional comedian, Maysoon has performed stand-up in top New York clubs, and has toured extensively in the USA as well as Europe, Africa, and the Middle East. She has also appeared on As The World Turns, Law & Order, MTV, NBC Nightly News, CNN, ABC’s 20/20, The New York Times, and BBC. She is a graduate of The Hala Salaam Maksoud Foundation for Arab-American Leadership and a delegate from the great state of NJ to the 2008 Democratic National Convention. She spends 3 months a year in Palestine where she runs Maysoon’s Kids, a scholarship and wellness program for disabled and wounded refugee children and orphans. Omar is an Egyptian-born actor/comic living in Los Angeles, California. Within a few months of doing stand-up, Omar has taken the comedy world by storm and has received international recognition from producers and seasoned comics alike. His accolades include a spot on SHOWTIME’s ‘Legally Brown,’ which premiers May 2011, and participation in comedy festivals and shows all over the world. Some of his credits include shows in New York, Texas, the Middle East, and in his home state of California. Having lived in Egypt, Europe and the U.S.A., his material appeals to a wide variety of audiences. His experiences and interactions with people from all over the globe, from the street vendors of Cairo to the gun-totin’ cowboys of Texas, have given Omar the unique insight of finding humor in all types of crazy this world has to offer! His ability to mimic voices and mannerisms brings these characters to life in hilarious impressions. Jon Stewart needs no introduction but he’s gonna get one anyway, because that’s the entire purpose behind this section of the website. So, ehem: Jon Stewart is the host of The Daily Show on little known network “Comedy Central.” When he’s not skewering politicians for being douche-holes, he’s skewering pop stars for being douche-holes, and he definitely throws a little skewer at journalists if they’re in the grips of a particularly douch-holey presentation of “the truth.” He’s a funny guy, that Jon Stewart. Little known fact, he loves Halal food carts. It’s very Jewish of him. Rachel Maddow is smarter than you – no really. She is. She hosts a kickass show on MSNBC strangely titled The Rachel Maddow Show. She’s also written a book Drift: The Unmooring of American Military Power, and if you don’t know what unmooring means, it’s because of that thing we said earlier about how she’s super smart. Little known fact, Rachel loves talking to Muslim filmmakers. Our gain, your entertainment! Colin Quinn sorta thinks sharia law is awesome. True story. He even says it. Out loud. In the movie. When he’s not busy hatching plans to impose shariah law, he’s busy doing specials on no-big-deal networks like HBO or you know, performing his one-man show on Broadway. He’s almost fully recovered from his long-standing show on Comedy Central, “Tough Crowd with Colin Quinn.” Basically, he’s a slacker. Lewis Black YELLS! And it feels oh-so good. He screams his polemics on the Daily Show, lambastes the haters on HBO, and casually wins Grammys for his comedy albums. CASUALLY! What does he know about Islam? He went to Turkey once and thought the mosques were “quite lovely actually.” What does he say about the forbidden pork? We cannot in good conscious print what he said, it was far too dirty and sexual. David Cross is pretty anti-religion. Not in a mean way, but in a “come on, are we really buying into this” way. That’s why we were extra hopeful he would be in a movie about Muslims! When the man isn’t tearing religion a new one in his standup, he’s writing books (I Drink for a Reason), or starring in his own IFC Show, “The Increasingly Poor Decisions of Todd Margaret.” And yes, he is the dude in the Alvin & The Chipmunks movies. Little known fact, the Chipmunks are totally Muslim. Audiences LOVE Janeane Garofalo. Some politicians say she gives them acid reflux. A comedian and social commentator of the highest order, Garofalo gets her paws dirty on shows like 24, The Tonight Show, Criminal Minds, Late Night, Real Time with Bill Maher, Ellen and oh my god just read her damn imdb page and leave us alone! Keith Ellison is a full-on MEMBER OF CONGRESS! In fact, he’s the first ever Muslim to be elected to the House of Representatives. Everyday he make’s Minnesota’s 5th district very proud and, in The Muslims Are Coming! he gives a very gentle and reasoned smack down to the Muz-haters and their nonsense. Guess what else? He’s super friendly in person – he’s downright delightful. Soledad O’Brien is among the best in the journalism trade. She sniffs out stories like a basset hound and her attention to race and ethnic issues cannot be matched! You can see her busting chops everyday on ye olde CNN. Little known fact: for Soledad, Fridays are “falafel and fries” day. She’s really into alliteration. Ali Velshi is a Muz! And he doesn’t care who knows it! This kindly Canadian has made more than a splash in the world of journalism and CNN keeps bringing him back for more, every weekend in fact, with Your Money. Listen to the man, he know stuff about money. Russel Simmons is the epitome of Business Tycoon. The man owns things, makes careers happens, builds empires from the ground up, and on top of it all he has a fine selection of Beanie Babies! He does a lot of great work bringing Muslims and Jews together. How else would a black hip-hop tycoon spend his time? Cenk is the host and biggest brain behind The Young Turks on Current TV. A native of New Jersey, Cenk bring Turkish-formerly-Muslim-currently-sorta-atheist aesthetic to television – a combination that is entertaining and informative with a cardamom aftertaste. We love. When Lizz Winstead insn’t traveling the country blowing people’s minds with her salty, insightful, and hilarious comedy, she’s writing books! Her latest is slated to come out so you can bring the magic of Lizz right to your living room coffee table (or bathroom, wherever you keep your finest literature, no judgement). She co-created the Daily Show, so you know, she’s also basically a genius. What a great Imam! How often do you hear that? You’re hearing it now, because for real, he’s a GREAT Imam! The man does so much for the Muslim community in New York and the rest of the country, we’re just pleased as punch he was able to join us in the mooovie. This is a man that ‘rabbis’ in style at the Hampton Synagogue. He’s also a highest order dude in the World Jewish Congress. And what does he do with all of his reach? He joins forces with Russell Simmons to build the Foundation for Ethnic Understanding to build bridges between the Muslims and the Jews. Guess what, one day, its gonna work! Are you ready for peace on earth? Rabbi Marc Schneier is.